A man hiking across the country had a major setback in Saskatchewan when he says his gear was stolen and destroyed on the Onion Lake Cree Nation. Dana Meise told CBC News Sunday he was making his way through the province when a family invited him to see the chuckwagon races in Onion Lake. He said he was getting ready to go to sleep in one of the wagons when he turned his back for a few minutes. That's when he said all his equipment was stolen. Meise and security officers searched the area, but with no luck. Hours later he found his backpack, burned, on the ground nearby. A hard drive, on which he had stored hundreds of hours of footage for a documentary project, was destroyed, he said. All his identification and credit cards, including his passport, were also destroyed. But the worst part, said Meise, was the loss of souvenirs from his years of hiking across Canada, which included bracelets given to him by the parents of dead soldiers. "I carried these things with me for thousands of kilometres in honour of my fellow Canadians and a gift to my country," he said. Meise said he'll also miss a pair of pants which had patches he had collected from each province. "Those were like a quilt of Canada, and they burnt them," he said. "I managed to salvage a few patches and that's it." Meise was attempting to be the first person to hike the entire Trans-Canada Trail. 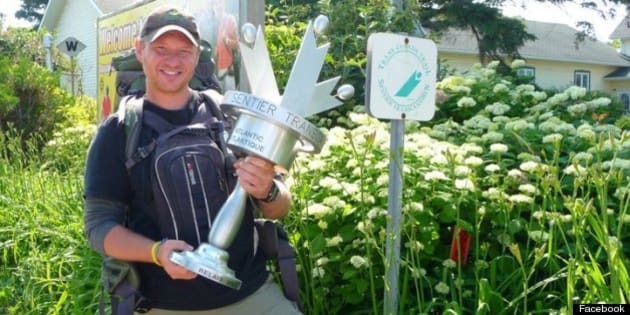 He started his 23,000-kilometre trek five years ago in Newfoundland and, hiking for six months each year, arrived in Saskatoon three weeks ago. For now he's staying at a Lloydminster hotel, paid for by his girlfriend. He's not sure what to do, he said, as he's stranded with no ID and no money. The Chief of Onion Lake told CBC News he was sorry to hear about what happened to Meise. Wallace Fox said he plans to get in touch with the hiker. He said he hopes the actions of a few people don't damage the image of his community, and said he wanted to replace Meise's gear. However, an outdoor equipment store in Saskatoon had already stepped in to help, giving Meise new equipment including a tent, sleeping bag and the necessities he needs to continue his trek.